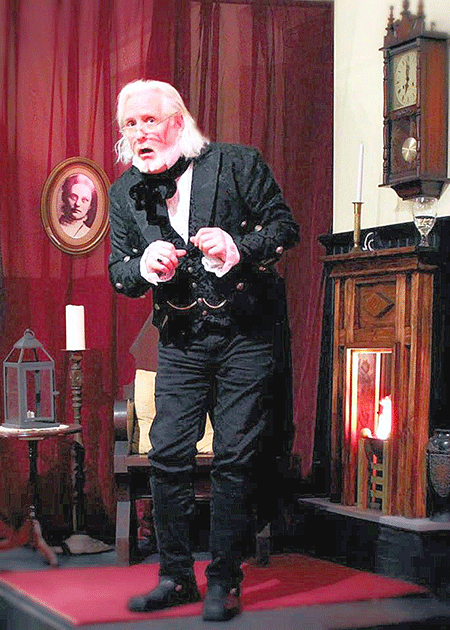 Richard O'Donnell is Ebenezer Scrooge in ‘Mr. Scrooge’ at OFA Auditorium, Ogdensburg. OGDENSBURG -- St. John’s Conservatory Theater, now in its fourth season, have cast an all-new original musical comedy “Mr. Scrooge” to open Dec. 15 for a weekend run. Based on Charles Dickens’ classic short story “A Christmas Carol,” show times are Friday and Saturday evenings, Dec. 15 and 16, at 7 p.m., with matinees Dec. 16 and 17, at 2 p.m. Tickets cost $15 at the door (suggested donation), or $10 at brownpapertickets.com. “Mr. Scrooge” showcases local talent from all over the North Country including Ogdensburg, Gouverneur, Heuvelton, Morristown, Lisbon, and Waddington. It stars Richard O’Donnell as Mr. Ebenezer Scrooge, Stephen Chambers as Jacob Marley’s Ghost, Gerard Powers as Scrooge’s nephew Fred, Angela Conzone Dwyer as Thelma Plum (The Ghost of Been There Done That), and Matilda Pift (The Ghost of Christmas Presents), Hailey Weber as Scrooge’s young love interest Belle, Cole Siebels as Young Scrooge, Brandon Bogart as Fezziwig, and Rachel O’Donnell as Mrs. Fezziwig. The street urchins star Cadence Payne as Nipper, Jillian Lebel as Cager, Gabi Ott as Birdie, Myah Myers as Scraps, Grant Brunet as Rusty, Maddison Lebel as Hattie, and Meghan Gardner as Dustbin. The Cratchit Family stars Christopher Dwyer as Bob, Lizzy Peo as Emily, Madison Miller as Bella, Ava Rutherford as Martha, and Maddison Cameron as Tiny Tina. Other roles include Mia Labella as Florence Sparkles, Calea Lebel as Matilda Sparkles, Delia Payne as Lizzy Sparkles, Rozalyn Dwyer as Dandelion Sparkles, and Ryan Woodard as Nocal Head the Mourner. Maddison Cameron is from Heuvelton, Richard O’Donnell, Angela, Christopher, and Rozalyn Dwyer, Stephen Cambers, Gabriella Ott, Madison Miller, Delia and Cadence Payne, Hailey Weber, Gerard Powers, Lizzy Peo, Ryan Woodard, Mia Labelle are from Ogdensburg, Grant Brunet is from Morristown, Ava Rutherford is from Waddington, and Calea and Maddison LaBel are from Lisbon. “Mr. Scrooge,” about a miserly old man who “bah humbugs” Christmas and all those who celebrate it, is mounted for its fourth year in a row. An annual holiday tradition, the play, with newly added music and characters, is fast becoming a must-see annual celebration of laughter, song, and dance, said a press release from St. John’s. “Mr. Scrooge” principal creative staff includes producing artistic director Mr. O’Donnell, musical director and choreographer Angela Conzone Dwyer, digital orchestrator and vocal arranger OFA graduate Ryan C. McNally, scenic and prop designer Stephen Chambers, costume and makeup designer Karen Fischbeck, senior costumer Heron Hetzler, technical director and production coordinator Christopher Dwyer, sound designer Richard Patton, stage manager Ashley Toppin, and props master Tonya Ott. For more information, please visit St. John’s Conservatory Theater’s Facebook page: www.facebook.com/stjohnsconservatorytheater.